Remember how I said “tex-mex” was my favorite? Well, it still ranks right up there. I like stews and soups and casseroles so… “tex-mex” is closer than say a burger. What “tex-mex” refers to is taco meat over rice with a little cheese on top. I enjoy comfort food and this is nice. I took a close up of the beans, which are darker on the top (at first glance you think “black beans”) and lighter on the inside (then you think “pinto beans”). I don’t know what kind of beans they were but I’ve always liked refried beans. They were ok. Next time I’ll take a picture of the nutritional facts of the tortilla chips. As a Texan, and someone who grew up on real Tex-Mex, I am horrified on your behalf. Oy vey. Tex Mex may not be the best food in the world for you, but at least the real stuff has vegetables: lettuce, tomato, onion, avocado, garlic. Why can the school not provide a break down of the nutritional information for each meal? Based on serving size of course. I think that should be a rule. i think we can all agree that those beans are gnarly..BUT beans are hardly ever aesthetically pleasing. this is better than "congealed cheese sandwich"
I didn't think "what kind of beans are those" at first. I thought, that looks like a TV dinner brownie. It's what it liked like to me in the first picture, anyway. haha. I had the same thought, Alyse. at least you got whole wheat tostitos. probably not the healthiest thing in the world, but i bet far better than the bright yellow corn chips (the same color as mustard) we used to get. This lunch is horrifying too me. It looks so, so unappetizing. Guess looks are deceiving? I won't mention what the beans and "tex mex" remind me of… No wonder kids opt out of eating lunch when it looks like that. I have a question. Couldn't you be found out if the staff at your school notice their lunch menu is the same as what you're eating every day? I still don't know how you're getting away with it! I don't know about Mrs. Q's school district, but ours has the same menu at all 30+ schools, which would make it hard to identify any one school by what they were having. Today's lunch looks relatively good, but smaller than usual. I'd be hungry again after an hour or two. 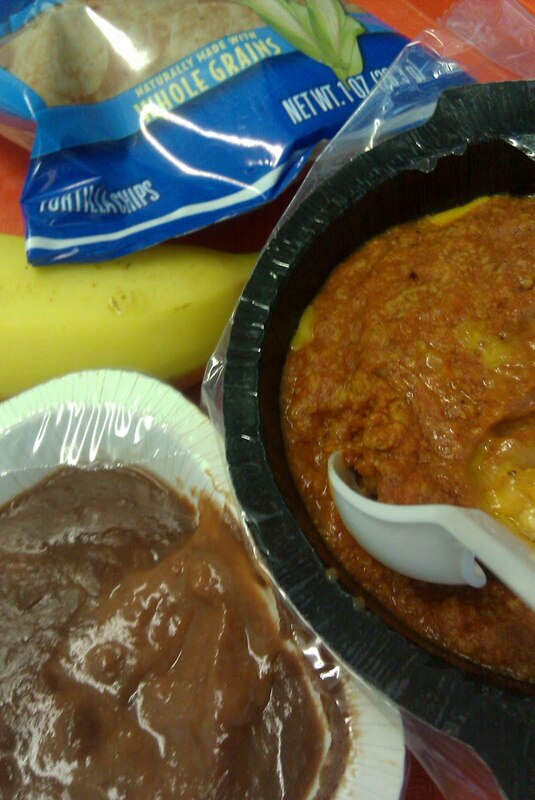 I thought the beans were some awful looking chocolate pudding! Hello, I enjoy your blog! I'm a Japanese.I used to work as an au pair in america for 2 years. before then, I helped kitchen at the preschool in Japan. and I'm working as a Japanese Chef so far. I know there are so many food things different between america and Japan. and I'm a one of the person who really want to change the american school lunch!!! I just wanted to tell you I like your work and the blog! I look forward to read next your blog post! anyhow, I miss tex mex!!! That looks disgusting. I can't believe the stuff they feed our kids. My son's school is the same, I restrict him to one "school meal" a month. I'm sorry Mrs. Q, but beans looks horrific. The whole tex-mex thing looked horrific. Its scary! That looks so, so wrong. so, are the beans supposed to be the vegetable? seriously, this is one sad meal. i get that it tasted good (though your photos say otherwise), but there is not much healthy food here. no fresh veggie is really astounding. Oh, no. Mrs. Q, that is not tex-mex. I concur with the other Texan commenter from above. And you're positive that isn't a bean flavored pudding?? Again, your bravery continues to amaze me everyday. Some one else said this, and I have to agree, I thought the beans were either some kind of chocolate pudding thing or a brownie. And I have a question…I've noticed the lunches look like they are like TV dinners…Does the school not actually cook food?…Is it heat and eat type stuff? If we are not part of the solution we are part of the problem. Negative criticism does not help. Rethinking does. Give the district feedback in which to improve the meal. If the food was prepared fresh in the kitchen with less packaging it would taste and look so much better. Brown rice could be used in place of white rice. There are low fat baked tortilla chips on the market. Freshly cooked,lowfat refried beans or black beans, not overcooked=poor quality and not reheated, are healthy and delicious. You can get commodity cheese that that is 100% cheese and low fat and delicious. I would serve this meal with a fruit and vegetable and skim milk only. The major problem here seems to be poor quality food, heat and serve, too much packaging, held for tooooo long. However, nutritonally, few nutrients are lost when food is overcooked or served in alot of packaging. The bottom line is children desire appealing, well presented, quality prepared food. Food poorly prepared does not taste good! My goal as a district manager for nutrition services is to provide high quality, simple, healthy food. If I can help give feedback for other districts, to help MORE CHILDREN, feel free to contact me. PS-Our food and labor cost are over $3.50 per meal. Our participation rate is 60%. Our free/reduced rate is less than 10%. Parents, but especially student are happy and have developed a palate and a craving for low fat, low sodium, high fiber foods that taste great. We ae making changes as I write to even simpler, fresh baked, simple, local foods. 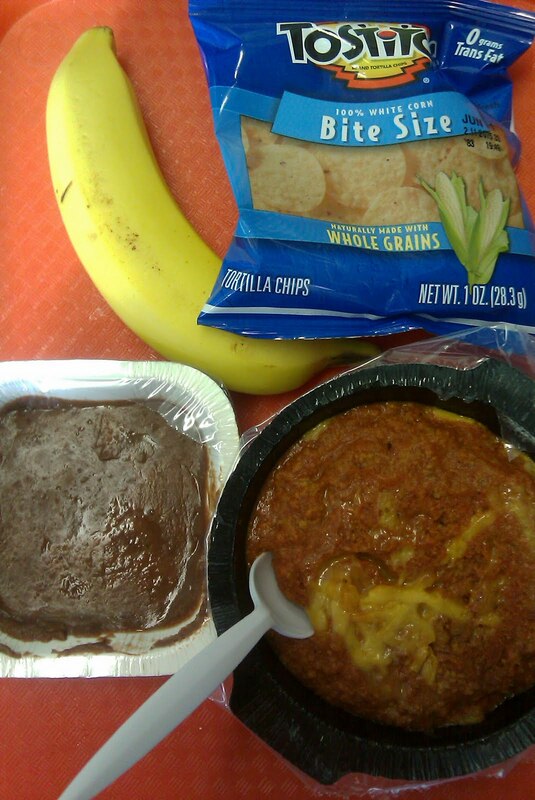 bananas and tex mex? Who thought up that combo? It seems like an endless field of mush apart from the corn chips (kudos to mayfieldflowerrn for pointing out that whole grain tostitos are just a new ploy for disguising the junk that's in it). Suddenly, you've got me curious what provisions there are at the school this week for students and staff observing Passover. Is there a hot lunch available without rice and chips? I just threw up in my mouth a little. Why not just place it directly into the toilet? This one looks soooooo scary! I am so impressed by Ms. Abel's post and the things that she is doing to improve school lunches in her district under the current restraints of the SLP! however, I do disagree with one point… I think there is a big difference between mere "complaining" and bringing awareness to an important issue. How many people had no idea how bad school lunches could be before reading this blog? Those people may do nothing else but talk to other people… and creating public support for change is important as well. As is getting parents to be more aware of what the schools are serving. Maybe those parents say something. Or just vote with their dollars and start packing lunch for their kids instead. There's a micro and macro way of looking at this issue…. I think your comment tends to focus on the micro level, while the benefits of this project are much more macro. This meal to me does not look like the worst meal in the world, but certainly not the best. Very curious to know what the "meat" actually is. Under current USDA regulations, schools do not have to disclose that they are serving "meat" containing "alternative protein products" (generally some sort of dry powder that is then reconstituted with water) so long as the alternative product is less than 30% of the total mixture. The overemphasis on grains is puzzling… rice and corn chips? Our school doesn't include the beans in this meal (which I'd like to try)but it is also one of my favorites. It is seriously delicious! I loved your feedback, thoughts and proactive perspective. Thank you. I always and continue to respond to ideas from others, students, parents, teachers, etc. that can help make things better. Many, many have offered solutions and we have worked on issues together. I can't do anything with a complaint unless I have a inkling of a solution to accompany it. It really does take a community to make things better. Teachers need to provide nutrition curriculum, parents need to role model it, nutrition staff need to be committed to learning new skills/food prep, wellness needs to be District goal. If a parent wanted to check the ingredient listing of any of our food products, they are always available. Many parents do since they want their child with allergies to eat our lunches. We work together to plan safe menu choices for them. Highly processed corn chips do not have enough grain in them to "count" as a bread equivalent (similar to a bread food group)so the rice was served. I believe that as soon as more models/solutions for change for the National School Lunch Program are in place they can be used as a guide for other Districts. Then the health of many more children will be enhanced and changes will be made. Oh, alot more money is needed as well. Just last week a School District made major changes in their lunch program based on guidelines from ours, they used our "recipe"…change takes time but if they have an action plan based on success, results will take place much faster. Cynthia – could you email me? I'd like to talk to you about a guest post. Thanks! Another horrified Texan here. "Tex-mex" gets a bad rap as a cuisine, but I think that's because of chains like Taco Bell. I don't think that's fair. That's like saying Dominoes represents Italian cuisine. Actual Tex-Mex is just the cuisine that grew up along the border region and northern Mexico, and it CAN be good. It's also cheap, since it was invented by people who didn't have a lot of money, making use of lots of rice, beans, cheaper cuts of meat, and a lot of the dishes are easy to make ahead and reheat later, like enchiladas, beans, etc. I see this as a feature, not a bug, but I guess it can lend itself to some crappy microwave meals. I guess what I'm bothered by is that they don't even bother to give this dish a name, just calling it "Tex-mex". That's not dish! There's a Mexican dish called Arroz Gratinado that's a rice casserole, but that name probably makes it sound too fancy. But naming it "tex-mex" is weird to me. It's like naming that penne pasta with meat sauce "italian".